Ask fellow campers about "Hot Springs Campground & Hostel" and nearby attractions. 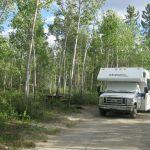 This campground is situated in an aspen grove. Sights only have electricity. I felt it was overpriced since there were only pit toilets near the sights. Showers were $1 per minute, the highest we found anywhere in Canada or Alaska. It is within a short walk to the swimming pool style hot springs. There is an admission discount when you present your camping receipt. We camped at Hot Springs Campground & Hostel in a Truck Camper. Deep in the woods where it's so very quiet, it's one of the loveliest campgrounds in Canada. Do ignore your GPS when it tries to send you off Takhini Hot Springs Road and left onto the dirt Takhini River Road. Just stay on the paved road until you see the Hot Springs straight ahead. The campground (very small sign on the right) is on a dirt road to the right just before the hot springs. Wind your way through the woods and stop at the hostel, where you register and get directions to your site. No, you don't have water or sewer at your site, but both are easily available at the hot springs itself, just outside the campground. The pull-through sites are longer than any normal big rig setup; some may require a bit of maneuvering around the trees to enter, though. We had no trouble getting into site 24 with a 36' motorhome. Site 25 was only 20 feet away, yet we felt utterly private, as there are trees and undergrowth separating each site. The power was on the wrong side, but with our extension cord, hookup was easy. How refreshing it is to have 50 amps so far north... We would happily stay here again. We camped at Hot Springs Campground & Hostel in a Motorhome. First and Foremost, Verify location! My camping app gave incorrect GPS coordinates and sent me down Takhini road which is a dirt road to the left before reaching the Hot Springs. Stay on the paved road until you reach the Hot Springs and the campground in on a dirt road to the right just before the hot springs. The following reviews are correct on many points that are a problem for me. the dump is off site at the Hot Springs, I think you have to go there for water as well. Mostly level - not exactly, I had to block the tires and jacks to get level on site 11. Shower is a dollar a minute. NO RV WASHING allowed! I am caked in mud from the wrong turn. I had to beg for water to wash my windshield on the toad. 35 dollars Canadian is too much for what is provided even with a favorable exchange rate. The 27 dollars reported above represents the equivalent US dollar rate. We camped at Hot Springs Campground & Hostel in a Motorhome. Great Destination park! Easy to navigate into wide pull thru sites with toad. Mineral hots makes this the destination park. Will return in June for a couple more days! We camped at Hot Springs Campground & Hostel in a Motorhome. Short trip into Whitehorse for lots to do! If we had stayed later in the season, perhaps I would have been happier. The website claims they are open all year, but don't expect much in April. None of the 50 amp sites were open. No water. No sewer (there is a dump station we were told, but did not look for it). Wi-fi was a joke. The outlet for the 30 amp was upside down. The hot springs are not part of the park, but you do get discounted admission with the RV park receipt. The site was somewhat level. The only up side was there is plenty of room between the sites, even though I think we were the only ones in the park. We camped at Hot Springs Campground & Hostel in a Motorhome. Returned in 2017 after twice in 2016. Awesome park, spacious, mostly level gravel sites. Elec only since all their wells keep coming up with hot water ... it IS Takhini HOT SPRINGS. Showers are better than my house, except the cost, but reasonable and you can control the timer. Well worth the drive from Whitehorse and not a bad drive back and forth. In Whitehorse, go to the Visitor Center and get a 3 day FREE parking pass for any city street. We camped at Hot Springs Campground & Hostel in a Travel Trailer. The campground also operates an 'Escape Games' building. Probably the best campground we have found on our trip through, B.C. Yukon Alaska. Yes there is no water at the sites (only hot water in the ground) and no sewer. The power is good and the WiFi was better than most slow, but look where you are. Lots of treed area between your neighbor. And of course hot springs a 2 min.walk. Pinic tables and Firepits, now this is camping.We stayed three nights, would have stayed longer, if there was time. We camped at Hot Springs Campground & Hostel in a Travel Trailer. Hiking close by and the Wildness thing, plus Whitehorse and all its attractions. Just down the road, lots of campers here for the fishing. We had electric at the spot and water was available down the road. There was a dump station at the hot springs that was not far away. The spot was wooded and felt private. Really enjoyed the hot springs and the people who ran it were really nice. Price was Canadian and the Hot Springs were included. We camped at Hot Springs Campground & Hostel in a Motorhome. $32 CAD, $25 USD. Short stroll to hot springs which are drained each morning and refreshed (saw them doing draining). Electric, no sewer. Level, gravel site with some trees, quiet, easy to navigate our Class C towing a jeep. Verizon signal ok, didn't use wi-fi. This is also a hostel. We camped at Hot Springs Campground & Hostel in a Motorhome. Go to nearby Yukon Wildlife Preserve, short drive toward Whitehorse. Showers are available in Hot Springs changing room. Seems the owner is working hard to upgrade what they can. Water is an issue since all their well drillings hit hot water ... after all, this is a 'hot springs' area. It's a rustic setting, electric only, but the facilities at the hotel building are superb. At night, it's the outhouse run. Staff friendly, café closed on Tues and Wednesday. For the value, a good choice. Will be staying here again in August. Just hope it doesn't rain then ... grounds could use more gravel. We camped at Hot Springs Campground & Hostel in a Travel Trailer. This campground is full of missed opportunities. Yet another campground created by non-campers. Roads are too narrow and only the best drivers of big rigs will make the curves without damaging trees and/ or vehicles. Some of the electric hookups were on the correct side, but some, like ours, were on the opposite side making plug-in difficult. The campground map does not show where trash or water is located. Called first to make a reservation and it went to voicemail - never got a return call. Other than actual checkin where someone did finally show up, each time we went to the office, no one was there. A sign inside the first door says "ring bell" but there is no bell there. The WiFi is free but they've set it up so you must look at their website first which has HUGE pictures and takes forever to load before you can go to email, etc. lots of flying gnat-like bugs here. On the positive side, we had 50 amp (no water or sewer at sites), and sites were plenty long and wide. Beautifully wooded area. they were working on leveling out the gravel road and there were men building structures, so maybe there's hope. They mostly just need to get their act together - with the nearby hot springs, they are sitting on a gold mine. Even with the downfalls of both the campground and hot springs pools, we will probably be back because the water in the hot springs is that good. This is a 35-minute drive from Whitehorse. We camped at Hot Springs Campground & Hostel in a Motorhome. Hot springs! You get a 20% discount if you are staying in the campground. Go to Whitehorse. Eat at Klondike Ribs and Salmon. Take a tour on the White Pass & Yukon Route narrow-gauge railway. Overnight stop for us. This is electric hookup only, fresh water available to fill up containers. Some of the sites are side by side pull -throughs, sites are level, big rigs could get in. No TV or Internet, just a wonderful quiet place. Hostel area here also, restrooms very clean. Pup loved it here, room to walk. We we would stay here again. We camped at Hot Springs Campground & Hostel in a Travel Trailer. The Hot Springs are within walking distance, very nice area. This is a very very nice park. It is set in the woods, very long and wide slots. Roads are adequate but watch for trees (or look at the scars from those who did not). Single water station at front of park and dump station off the Hot Springs road. Wish they had full hookups so we could stay longer without having to pull out and dump/fill. Whitehorse is about 20 minutes away and they are a mile away from the wildlife preserve. Hot Springs is a single concrete pool, lots of locals tend to visit in the late afternoon and evenings but still nice. Locker rooms are clean, but shower requires a lot of arm strength! We camped at Hot Springs Campground & Hostel in a Fifth Wheel. This park seems to be under construction. Entry road very rough. When we arrived we found out this is not a "full service" RV park. Having boon docked for a week, this was a real disappointment because the spaces appeared nicely treed and shady. Showers would cost "only" $3/day each person and had to walk to the hot springs which wasn't an open for us as it would be a hike. Therefore, definitely not a senior friendly park. We camped at Hot Springs Campground & Hostel in a Motorhome. We chose a dry-camp site; electric sites cost $15 - $20 more. Paved road to the park, but narrow dirt road to sites. (Be sure to emphasize how large your rig is and how much room you need to maneuver when making reservations, and again upon check-in.) Sites are in the trees, so there's lots of shade. Hot springs pool is great! Campers get a discount on the pool fee. Quiet location. We camped at Hot Springs Campground & Hostel in a Fifth Wheel. Hot springs! You get a 20% discount if you are staying in the campground. Go to Whitehorse. Eat at Klondike Ribs and Salmon. Take a tour on the White Pass & Yukon Route narrow-gauge railway. Are you affiliated with Hot Springs Campground & Hostel ?